My Father-In-Law makes the best ribs. He spends all day smoking them and then grilling them to perfection. They taste absolutely amazing and can't be beat. 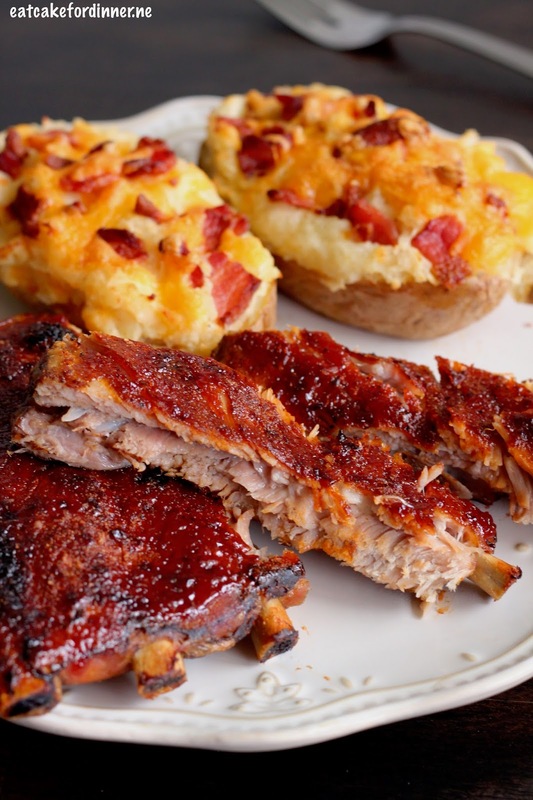 This recipe is for all of us rib lovers that need a super easy recipe that has great results with very little hands-on time. These ribs start out with a dry rub and are cooked in the slow-cooker without adding any additional liquid. The ribs will release their own liquid as they cook and there is no need to add any extra. Then, once they are tender, you brush them will barbecue sauce and broil until they are charred and absolutely perfect. These ribs are so so so tender. You can pull the bone out without any effort. 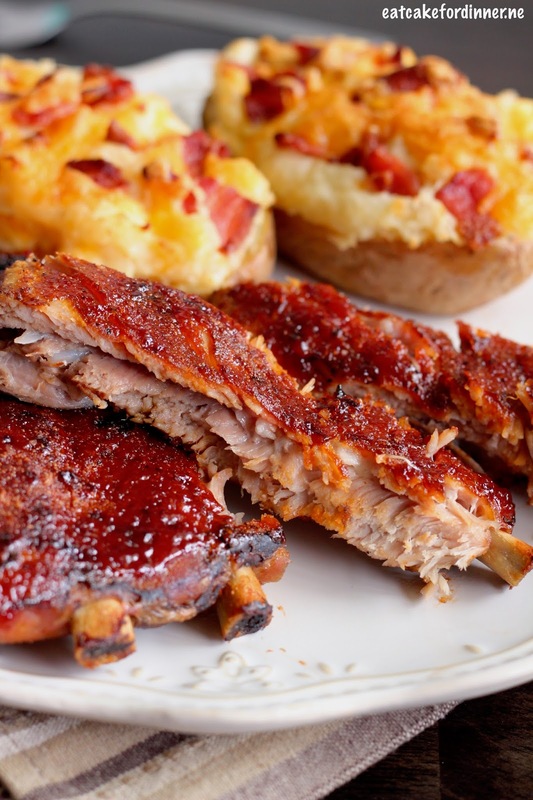 These will definitely satisfy that rib craving. 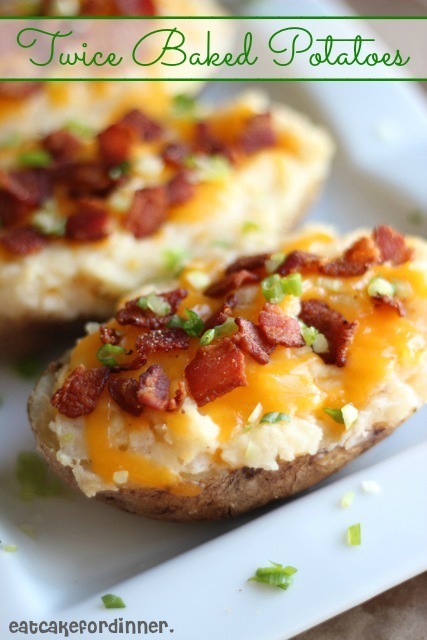 I served mine with My Favorite Twice Baked Potatoes and it was an incredible Sunday dinner. In a small bowl, combine paprika, brown sugar, salt, pepper, onion powder and garlic powder; set aside. Pat ribs dry with paper towels and coat all over with rub. Arrange ribs vertically with thick ends pointing down and meaty side against interior wall of slow-cooker (ribs will overlap). Cover and cook until ribs are just tender, around 6 to 7 hours on low. Line rimmed baking sheet with aluminum foil and set a wire rack in pan. Using tongs, carefully transfer ribs, meaty side up, to prepared rack. Let ribs sit for 10 minutes to allow surface to dry out. Adjust oven rack 3 inches from broiler element and heat broiler. Liberally brush ribs with 1/2 cup of barbecue sauce and broil until sauce begins to char, about 4 minutes. Remove ribs from oven, brush with additional sauce, if desired. Tent with foil and allow to rest for 20 minutes. Cut ribs in between bones to separate and serve. Jenn's Notes: This also works if you want to cover the ribs with the rub the night before, wrap in plastic wrap and refrigerate overnight. Then, add to the slow-cooker in the morning.